[139 Pages Report] The aerodynamic market for automotive was valued at USD 22.80 billion in 2017 and is projected to reach USD 32.77 billion by 2025, at a CAGR of 4.77% during the forecast period. The base year for the report is 2017 and the forecast period is 2018 to 2025. The research methodology used in the report involves primary and secondary sources and follows a bottom-up approach for the purpose of data triangulation. The study involves the country-level OEM and model-wise analysis of the aerodynamic market for automotive. This analysis involves historical trends as well as existing market penetrations by country as well as vehicle class. The analysis is projected based on various factors such as growth trends in vehicle production and adoption rate by OEMs. The analysis has been discussed and validated by primary respondents that include experts from the automotive industry, manufacturers, and suppliers. Secondary sources include associations such as China Association of Automobile Manufacturers (CAAM), International Organization of Motor Vehicle Manufacturers (OICA), European Automobile Manufacturers Association (ACEA), Environmental Protection Agency (EPA), Society of Indian Automotive Manufacturers, SAE International, and paid databases and directories such as Factiva. The ecosystem of the aerodynamic market for automotive consists of established automotive aerodynamic application manufacturers such as Magna (Canada), Roechling Automotive (Germany), Plastic Omnium (France), SMP Deutschland GmbH (Germany), Valeo (France), SRG Global, Inc. (US), Polytec Holding AG (Austria), AP Plasman (Canada), INOAC Corporation (Japan), Rehau Ltd. (Switzerland), PU Tech Industry Sdn. Bhd (Malaysia), Brose Fahrzeugteile GmbH & Co. KG (Australia), HBPO GmbH (Germany), Spoiler Factory (Australia), Batz, S Coop. (Spain), Piedmont Plastics, Inc. (US), Airflow Deflector Inc. (US), and a few globally-established suppliers such as Hilton Docker Mouldings Ltd. (UK), Johnson Electric Holdings Ltd. (Hong Kong), and Sonceboz (Switzerland). 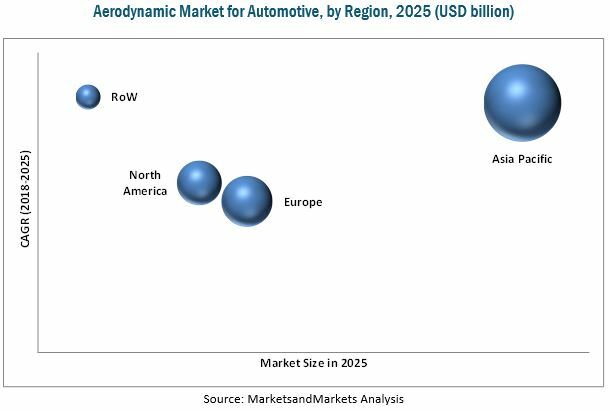 The aerodynamic market for automotive is projected to grow at a CAGR of 4.77% from 2018 to 2025. The market is estimated to be USD 23.65 billion in 2018 and is projected to reach USD 32.77 billion by 2025. The key growth drivers of this market are the flourishing demand for faster and sophisticated vehicles, better mileage, weight reduction, and increased stability of the vehicles. Aerodynamic application mechanisms, especially passive aerodynamic systems have become an integral part of light-duty vehicles. While they are primarily incorporated for reduction in fuel consumption and visual appeal, some LDV manufacturers also have them in their models to stay competitive in the market. Hence, the automotive aerodynamics market is proportionately increasing with the production volumes of LDVs. Thus, the LDV segment has the highest market share in the automotive aerodynamics market. The grille segment is estimated to be the largest segment in this market, by application. This is because, all the vehicle types, be it ICE vehicles, i.e., LDVs and HCVs, or EV types, i.e., BEVs and HEVs, are equipped with grilles that primarily serve the cooling requirements of engines. The latest development in these grilles known as the active grille shutter is the most commonly used active aerodynamic system in LDVs. All these factors contribute to the highest market share of this application in the automotive aerodynamics market. A key factor restraining the growth of this market is the difference of opinions between vehicle designers and engineers while experimenting with new aerodynamic applications.